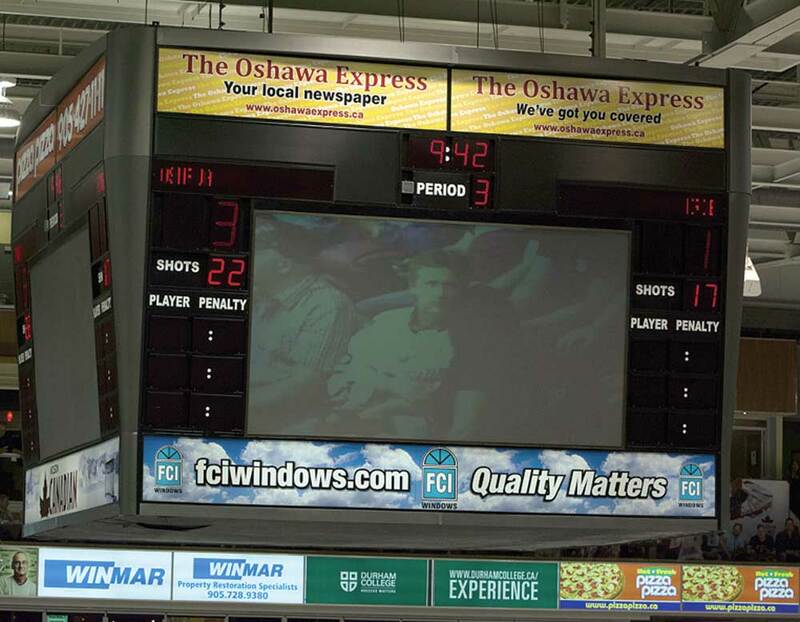 Discussions between the Oshawa Generals and the city on a new jumbotron for the General Motors Centre are ongoing. Earlier this month, Rocco Tullio, the OHL team’s owner, offered for the club to pay for the new screen if the city were willing to make concessions on its shared marketing agreement. Discussions surrounding the Oshawa Generals’ offer to pay for a new jumbotron at the General Motors Centre are still ongoing at city hall, Mayor John Henry says. On Feb. 1, team owner Rocco Tullio appeared before council, and prior to the meeting going into closed session, offered the choice to have his OHL club pay for an entire new scoring and video system in exchange for some “concessions” on the shared marketing agreement between the two organizations. Currently, the Gens handle all advertising in and around the GM Centre with the revenue, being split evenly with the city. It’s unclear what those conditions on the current agreement would be, and Henry says what was shared in the public meeting isn’t the entire story. “What was made here in the meeting that the public heard, isn’t the entire conversation,” he says. “So, let’s get through the entire conversation, iron out all the terms and conditions related to this and see where we get. Henry also said that when the offer was made in the meeting, it was the first time he’d heard of it. Prior to that, the Gens had offered to pay for part of the new scoreclock in conjunction with the city, along with some sponsorship conditions. That offer fell through after talks dissolved this past summer. As talks continue, Henry says it’s about finding a solution that will work for everyone.